Draft: 2003, Atlanta Braves, C1th rd. Resides in West Palm Beach, FL during the offseason with his wife, Ashley, and their daughters, Sidney, Hunter Riley and Sloane. According to the Elias Sports Bureau, his 14-letter last name is the longest in baseball history. Played in both the Miami Marlins and Arizona Diamondbacks organizations in 2015. Combined to play in 79 games between Miami and Arizona and hit .225 (45-for-200) with 26 runs scored, 15 doubles, nine home runs and 24 RBIs. Hit .308 (8-for-26) with two doubles and one RBI as a pinch hitter -- ranked tied for 10th in the National League in pinch hit average. Began the season with the Marlins and was designated for assignment on April 27...was released on May 5. Signed by Arizona as a minor league free agent on May 7. Assigned to Triple-A Reno, where he played in nine games and hit .188 (6-for-32) with two runs scored, two home runs and seven RBIs. Had his contract purchased from Triple-A Reno on May 29. Hit .333 (7-for-21) with three doubles and a RBI over a seven-game stretch from June 21-July 7. Sidelined from July 12-27 with a left neck strain. Assigned to the AZL D-Backs on July 23 -- played in two games during his rehab assignment and hit .250 (1-for-4) with a run scored and a RBI. Finished the month of September with a .304 (14-for-46) batting average with six runs scored, three doubles, five home runs and 12 RBIs -- homered in four straight starts from September 8-16. Spent season with World Series champion Boston Red Sox. Batted .276 in 119 games at catcher, which ranked third among American League backstops. His 65 RBI as catcher ranked third among AL counterparts, and 14 home runs tied for fourth. Finished regular season campaign on season-long 11-game hitting streak, batting .410 (16x39) with five doubles, three home runs and 11 RBI, as well as a .439 on-base percentage. Also, had season-long stretch of five consecutive games with an RBI from August 16-21, setting new career high. Had four stolen bases over eight-game span from September 1-17, including a theft in three-of-four games between Sept. 12 & 17. Had just one career stolen base in 580 career games prior to that stretch (Sept. 3, 2011 vs. Texas for Boston). Batted .294 (90x306) against right-handed pitching; his career average against right-handers entering 2013 had been .254. Also, 12 of his 14 home runs came against right-handers. Batted .284 (48x169) following All-Star break, compared to .266 (68x256) prior. Included marks of .282 (22x78) in August and .314 (16x51) in September. Batted .300 (3x10, 2b, 3 rbi) in three games during Divisional Round of playoffs, but just .136 (3x22, 2 rbi) in seven games during American League Championship Series and World Series. Was first career appearance in postseason. Most frequent spot in lineup was seventh, where he batted .242 (56x231) in 64 games; second-most frequent was six hole, where he batted .345 (29x84) in 22 games. Homered twice on June 9 vs. the Angels (2x4, 4 rbi), his only multi-homer game of season and fourth of career. Homered in back-to-back contests on September 12 at Tampa Bay and Sept. 13 vs. the Yankees. Was designated hitter on April 21 vs. Kansas City (1x4) and pinch hitter (0x1) in last frame of 2-1, 10-inning walk-off win over Tampa Bay on April 13; all other appearances during season were at catcher (119 games, 111 starts; both career highs). Set single-season career highs in games (121), at-bats (405), runs (55), hits (90), homers(25), RBI (59), walks (38), and extra-base hits (43) in his 2nd full season with the Red Sox...Also posted his highest SLG percentage (.454).His 25 home runs ranked 3rd among ML catchers after COL's Wilin Rosario (28) and CWS' A.J. Pierzynski (27)...Finished 4th in SLG (min. 375 PA) among AL catchers.Led the team in homers, the 1st Red Sox catcher to do that since Carlton Fisk in 1973...Were the most homeruns for a Sox catcher since Jason Varitek in 2003 (25) and 1 shy of the single-season high for a BOS playerwhose primary position is catcher, trailing only Carlton Fisk's 26 homers in 1973 and 1977 (all while catching)...1 of Saltalamacchia's roundtrippers came while at DH and 1 was as a pinch-hitter.Led AL with 15.30 AB per HR as a catcher (352 AB/23 HR), 2nd in the majors to COL's Wilin Rosario (14.04)and the top single-season mark by a Red Sox catcher with at least 200 PA at the position since at least 1974.24 of his 25 homers came against right-handed pitching...Batted .230 (81-for-352) against right-handers and.170 (9-for-53) vs. lefties.Made 95 starts behind the plate and caught a career-high 104 games overall...Also started 12 times at DH...Made 1 appearance at 1st base, shifting from DH in the 8th inning on 8/12 at CLE...Was his 1st appearance atthe position since 9/10/10 at OAK.Ranked 5th in the AL in games caught, starts behind the plate (tied) and innings caught (852.0)...Threw out15.8 percent of attempted base stealers (15 of 95).Committed just 6 passed balls, tied for the 2nd-fewest among AL players with at least 100 games caught afterBAL's Matt Wieters (5 in 134 games caught).Caught all 17 innings on 5/6 vs. BAL, the longest complete game by a Red Sox catcher since Jason Varitekwent all 19 innings on 7/9/06 at CWS.Hit 6 roundtrippers in May, a career high for any month, and hit 5 in both June and July.His 17 home runs at the break led all ML catchers...It marked the most homers by an AL backstop prior to thebreak since NYY's Jorge Posada in 2003 (17) and the 2nd-most ever by a Red Sox catcher before the All-Starbreak (since 1933) behind Carlton Fisk in 1973 (18).Made his 1st career start in the cleanup spot on 6/16 at CHC and went 2-for-3 with a double, homer, 2 RBIand a walk...In all, reached base in 7 of 9 starts as the 4th hitter in the lineup...Went 3-for-13 (.231) with 4 RBI as a pinch-hitter...Drove in BOS's only runs with a 7th-inning pinch-hit singlein a 4-2 loss on 6/9 vs. WAS.Made 2nd straight Opening Day start behind the plate for BOS on 4/5 at DET, his 4th in a row overall including2 with TEX from 2009-10.Went deep twice on 4/26 at CWS, matching a single-game career high for the 3rd time, 1st since 8/22/07 forTEX at BAL (G1)...Tallied 4 hits on 4/21 vs. NYY, matching a career high for the 2nd time, also 8/22/07.Matched the team lead with 6 homers in May and ranked 5th among AL qualifiers with a team-leading .628 SLG in the month...Was the best SLG by a Red Sox catcher in any month (min. 50 PA) since Jason Varitek in April2005 (.630) and the best by a Sox catcher in May since Carlton Fisk in 1977 (.647).Led the majors with a .804 SLG in his last 16 games in May beginning 5/12, during which he hit .373 (19-for-51) with 4 doubles and 6 homers...Knocked 5 roundtrippers in a 10-game stretch from 5/19-31.Went 3-for-4 with a home run and a season-high 5 RBI on 5/13 vs. CLE...Was the 2nd-highest RBI total of hiscareer behind 8/22/07 at BAL with TEX (7).Left game on 5/18 at PHI in the bottom of the 5th inning with a left ear laceration after being struck by aball that deflected off Ty Wigginton...Returned to the starting lineup the next day and homered in back-to-back contests following the injury from 5/19-20 at PHI.Connected for his 1st career walk-off homer and his 1st career pinch-hit homer with a 2-run shot 5/26 vs. TBin the 9th...Was the 1st pinch-hit walk-off shot by a Red Sox since Wes Chamberlain on 5/9/95 vs. BAL...10 dayslater on 6/3 at TOR, hit a 9th-inning game-tying homer, his 1st career HR that knotted a game in the 8th or later.Fell a single shy of the cycle 9/12 vs. NYY, reaching in all 4 plate appearances (double, triple, homer, walk)with career-high 3 extra-base hits...His 9 total bases were the most by a Red Sox catcher in a game against theYankees since Jason Varitek on 7/4/03 at NYY (12).Drew 11 walks in his last 17 tilts, averaging 6.0 PA/BB (66 PA) compared to 14.2 PA/BB prior to that point(382 PA/27 BB)...Had 10 free passes in September for his 2nd-most in any month of his career (11 in May2008)...Tied career-high with 3 walks on 9/5 at SEA (also 5/14/08 with TEX vs. SEA).Following the season, honored by the Boston BBWAA as winner of Tim Wakefield Community Service Award. Set single-season career highs in virtually every category in 1st full season with theRed Sox, including games (103), at-bats (358), runs (52), hits (84), doubles (23), triples (3),homers (16), extra-base hits (42) and RBI (56)...Also posted his highest SLG percentage (.450)...Marked his 1st season spending the entire campaign in the Majors without a stint on the DL...Placed 3rd in the AL in SLG (.452) and triples (3) as catcher and 4th in extra-base hits (42) at the position.Went 3-for-9 (.333) with a double and 8 RBI with the bases loaded...Appeared in 101 games at catcher, including 96 starts...Caught a career-high 28 runners attempting to steal,the most by a Red Sox catcher since Jason Varitek's 29 in 2002 and 3rd most for an AL backstop in 2011...Ledthe Majors with a career-high 26 passed balls, the most for any Major League catcher since Mike Macfarlanehad 26 with the Red Sox in 1995...21 of those 26 passed balls came with Tim Wakefield pitching...Threw out 2 attempted base stealers on 3 occasions, tying a single-game career high...Did it on 7/25 vs. KC,8/5 vs. NYY and 9/20 vs. BAL, bringing career total to 6 times...Nabbed 15 of last 43 (34.9%) attempted basestealers beginning 7/25 through the rest of the season...Hit 3 triples in 2011 after having just 1 previously in his career, on 9/24/07 vs. LAA while with Texas...Collected season-high 4 RBI twice, 7/24 vs. SEA and 9/13 vs. TOR...Were his 1st tilts with at least 4 RBI sincehe drove in 4 on 5/5/09 at SEA with the Rangers...Made 3rd career Opening Day start, 1st with the Red Sox, on 4/1 at TEX...Recorded his 100th career RBI on 4/17 vs. TOR with the 3rd of 3 runs driven in on the day...Collected an RBI in 4 straight games from 5/15-22, the longest such streak of his career...Hit 1st homer of the season on 5/15 at NYY, a solo shot in the 8th to give the Red Sox a 7-5 lead in an eventual7-5 win...Was his 1st homer since 8/2/09 vs. SEA while with Texas, snapping a 40-game and 121-AB homerlessdrought...The 40 contests marked the longest homerless stretch of his career...Hit at a .327 clip (17-for-52) in 15 June games...Notched career-high, 12-game on-base stretch from 6/16-7/7...Batted .293 (12-for-41) with 7 walks in that time...Homer in the 7th on 7/7 vs. BAL was the last of back-to-back-to-back shots (following David Ortiz and Josh Reddick)...Did not play 7/8 vs. BAL but was ejected in the 8th inning by home-plate umpire Mike Estabrook after abench-clearing incident, his 1st career ejection...Tallied a 9-game hit streak from 7/18-8/1 over which he hit .378 (14-for-37) with 3 doubles, 4 homers, 12 RBI,9 runs and a walk...Tied for the longest stretch of his career (also 5/22-6/2/09)...Scored the winning run from 2nd base in the 9th on 8/2 vs. CLE on Jacoby Ellsbury's walk-off single...Had pinch-run for Jason Varitek, his 2nd-career pinch-running assignment, also 6/20/08 at WSH with TEX.Swiped 2nd base in the 4th inning on 9/3 vs. TEX, his 1st-career stolen base...Allowed career-high 4 passed balls 9/18 vs. TB, most in a game for a Sox catcher since Josh Bard had 4 on 4/26/06...After the season, received the Good Guy award from the Boston Baseball writers...The award is given to an individual- player, coach or executive - who consistently and professionally handles the media obligations ofbeing a Boston Red Sox, and serves as an example for teammates and others to follow. Split the year between the Rangers and Red Sox organizations, appearing in a careerlow12 Major League games overall.Reached base in 10 of 30 Major League plate appearances (4 H, 6 BB), including 9 of 25 as a Red Sox (3 H, 6 BB).Traded to the Sox from Texas at the 7/31 trade deadline in exchange for 1B Christopher McGuiness, RHPRoman Mendez, a player to be named later (C Michael Thomas) and cash considerations...Was immediatelyoptioned to Triple-A Pawtucket.Recalled to Boston on 8/11 and made his Red Sox debut that night as a defensive replacement behind theplate...Appeared in 10 games with Boston overall, including 6 behind the plate (5 GS).Made 1st start as a member of the Red Sox on 8/12 at TOR and went 2-for-4 with 2 doubles...Became 1stplayer with at least 2 extra-base hits in his 1st start at catcher for the Sox since Matt Batts in the opener of adoubleheader on 9/11/47 (double, home run)...Threw out 1 of 2 attempted base stealers in the game.Landed on the disabled list on 8/19 (retro to 8/16) with a right lower leg infection...Went 5-for-15 (.333) with2 doubles, 1 homer and 4 RBI in 4 rehab games with Triple-A Pawtucket.Played in 7 games, including 3 starts, after being activated from the DL on 9/1, but underwent season-endingsurgery to repair a torn ligament in his left thumb on 9/28...The surgery was performed by Dr. Thomas Grahamat the Cleveland Clinic.Pinch-hit for Lars Anderson at OAK on 9/10 and moved to 1st base, his 1st appearance at the position since9/30/07 with Texas.Hit .278 (10-for-36) with 5 doubles, 1 homer, 6 RBI and 4 walks in 9 games with the PawSox overall, including4 rehab contests.Appeared in 2 games (1 GS) for Texas to start the season, including his 2nd career Opening Day start...Hadthe game-winning hit in the season opener (4/5 vs. TOR), a bases loaded, walk-off single in the 9th in a 5-4win...Marked the Rangers 4th walk-off victory ever on Opening Day.Placed on the 15-day DL with upper back stiffness on 4/8...Activated on 4/27 and optioned to Triple-A OklahomaCity where he stayed until the trade to Boston...Played 63 games overall with the RedHawks, includingrehab, batting .244 (58-for-238) with 11 doubles, 2 triples, 11 homers, 33 RBI and 37 runs. After beginning his season at Oklahoma (AAA), joined the big league club in late April and shared catching duties for much ofthe season until suffering a right forearm injury on Sept. 1...was in competition for the starting catcher's job deep into spring training,but was optioned to Oklahoma on March 26...had a productive start at Triple-A, never saw the minors again after joining Texas onApril 25...was one of the top players in the Dominican Winter League after the season. Named the top prospect in the Braves' organization by Baseball America prior to the 2006 season and again after the season. Was named the 10th-best prospect in the Southern League by Baseball America after the 2006 season...Suffered through a 2-for-39 hitting slump and before going on the disabled list with a wrist injury on 7/2...Came off the DL on 7/14 and proceeded to hit .352 (25-for-71) in 23 games after coming off the DL...Had just four homers when he went on the DL, then hit five in the month following his disabled stint...Had a season-high eight-game hitting streak 7/26-8/4 (.500, 14-for-28)...His best game was on 7/27 at MOB where he became the sixth-ever M-Brave with a two-homer game (one grand slam) and had a team-record six RBI. He became the third M-Brave to hit a grand slam...A month after coming off the DL, was selected to play for the US National Team in the Olympic QualifyingTournament in Cuba. Hit .226 (7-for-31) with a home run and four runs batted in as the U.S. won the tournament to qualify for the 2008 Beijing Olympics...Tore up the Arizona Fall League following the season, hitting .565 (13-for-23) with three homers and 12 RBI in just six games. Rated as the Braves' second-best prospect by Baseball America following the season...Was namedthe Myrtle Beach (A) Player of the Year by the Braves organization...Was named to the Carolina League regularand postseason all-star teams. Was also named to the Baseball America postseason Carolina LeagueAll-Star Team and to its High AAll-Star Team...Also was named to the Baseball America first-team, all-minors,postseason all-star team...Ranked in the top three among Braves minor leaguers in batting average (.314,third), hits (144, second), doubles (35, first), RBI (81, third) and OPS (.913, third)...Was fourth with 19 homeruns...His .519 slugging percentage was the highest single-season mark in Myrtle Beach history...Was namedJuly (.411-6-18) and August (.313-6-28) Myrtle Beach Player of the Month...Named Carolina League Playerof the Week for the week of 8/2, hitting .429 with two homers...Played 21 games with the Phoenix Desert Dogsof the Arizona Fall League, hitting .288 (21-for-73) with a homer, 16 runs and eight RBI... Homered in the titlegame, as the Desert Dogs won the AFL title...Played on the USA Baseball team that took part in November'sCONCEBE Regional Olympic Qualifying Tournament, where he hit .875 (7-for-8) with two home runs, fiveruns batted in and four runs scored in just three games...Had game-winning single in the bottom of the ninthto break a 4-4 tie with Mexico in the second game...Hit a pair of solo homers vs. Panama. Selected by Baseball America as the seventh-best prospect in the South Atlantic League...In 19 July games with Rome (A), he led the team with a .347 avg. (25-for-72)...Led the team with 16 RBI in May...Nineof his 10 home runs were hit on the road. Began his professional career with the Gulf Coast Braves (Rookie)...Ranked second on the team with11 doubles and 28 walks. October 29, 2018 C Jarrod Saltalamacchia elected free agency. 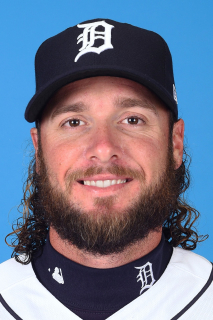 September 9, 2018 Detroit Tigers selected the contract of C Jarrod Saltalamacchia from Toledo Mud Hens. April 5, 2018 C Jarrod Saltalamacchia assigned to Toledo Mud Hens. March 9, 2018 Detroit Tigers signed free agent C Jarrod Saltalamacchia to a minor league contract and invited him to spring training. November 4, 2017 C Jarrod Saltalamacchia assigned to Charros de Jalisco. November 4, 2017 Charros de Jalisco placed C Jarrod Saltalamacchia on the reserve list. June 30, 2017 Buffalo Bisons released C Jarrod Saltalamacchia. May 17, 2017 C Jarrod Saltalamacchia assigned to Buffalo Bisons. May 16, 2017 Toronto Blue Jays signed free agent C Jarrod Saltalamacchia to a minor league contract. May 3, 2017 Toronto Blue Jays released C Jarrod Saltalamacchia. April 28, 2017 Toronto Blue Jays designated C Jarrod Saltalamacchia for assignment. April 2, 2017 Toronto Blue Jays selected the contract of C Jarrod Saltalamacchia from Buffalo Bisons. April 2, 2017 Toronto Blue Jays activated C Jarrod Saltalamacchia. February 6, 2017 Toronto Blue Jays signed free agent C Jarrod Saltalamacchia to a minor league contract and invited him to spring training. February 6, 2017 C Jarrod Saltalamacchia assigned to Buffalo Bisons. November 3, 2016 C Jarrod Saltalamacchia elected free agency. December 6, 2015 Detroit Tigers signed free agent C Jarrod Saltalamacchia. November 2, 2015 C Jarrod Saltalamacchia elected free agency. July 27, 2015 Arizona Diamondbacks activated C Jarrod Saltalamacchia from the 15-day disabled list. July 23, 2015 Arizona Diamondbacks sent C Jarrod Saltalamacchia on a rehab assignment to AZL D-backs. July 17, 2015 Arizona Diamondbacks placed C Jarrod Saltalamacchia on the 15-day disabled list retroactive to July 12, 2015. Strained left neck. May 29, 2015 Arizona Diamondbacks selected the contract of C Jarrod Saltalamacchia from Reno Aces. May 16, 2015 C Jarrod Saltalamacchia assigned to Reno Aces. May 15, 2015 Arizona Diamondbacks signed free agent C Jarrod Saltalamacchia to a minor league contract. May 5, 2015 Miami Marlins released C Jarrod Saltalamacchia. April 27, 2015 Miami Marlins designated C Jarrod Saltalamacchia for assignment. April 24, 2015 Miami Marlins placed C Jarrod Saltalamacchia on the paternity list. June 19, 2014 Miami Marlins activated C Jarrod Saltalamacchia from the 15-day disabled list. June 16, 2014 Miami Marlins sent C Jarrod Saltalamacchia on a rehab assignment to Jupiter Hammerheads. December 6, 2013 Miami Marlins signed free agent C Jarrod Saltalamacchia. September 1, 2010 Boston Red Sox activated C Jarrod Saltalamacchia from the 15-day disabled list. August 27, 2010 sent C Jarrod Saltalamacchia on a rehab assignment to Pawtucket Red Sox. August 19, 2010 Boston Red Sox placed C Jarrod Saltalamacchia on the 15-day disabled list retroactive to August 16, 2010. Infection in his lower right leg. August 11, 2010 Boston Red Sox recalled Jarrod Saltalamacchia from Pawtucket Red Sox. July 31, 2010 Texas Rangers Traded C Jarrod Saltalamacchia to Boston Red Sox; Lowell Spinners Traded RHP Roman Mendez to Spokane Indians and Greenville Drive Traded 1B Chris McGuiness to Bakersfield Blaze. July 31, 2010 Boston Red Sox optioned Jarrod Saltalamacchia to Pawtucket Red Sox. April 27, 2010 Texas Rangers optioned C Jarrod Saltalamacchia to Oklahoma City RedHawks. April 19, 2010 sent C Jarrod Saltalamacchia on a rehab assignment to Oklahoma City RedHawks. April 8, 2010 Jarrod Saltalamacchia roster status changed by Texas Rangers. December 1, 2009 C Jarrod Saltalamacchia assigned to Toros del Este. November 21, 2009 C Jarrod Saltalamacchia assigned to Leones del Escogido. September 2, 2009 Texas Rangers activated C Jarrod Saltalamacchia from the 15-day disabled list. August 29, 2009 sent C Jarrod Saltalamacchia on a rehab assignment to Frisco RoughRiders. June 13, 2003 Atlanta Braves signed C Jarrod Saltalamacchia.